After the destruction of the strongholds of evil in the north of Middle-earth at the end of the First Age, Sauron fled southwards seeking new lands. At the end of the first millennium of the Second Age, he chose a land walled by mountains, and there built his great fortress of Barad-dûr. After Sauron settled there, the land became known as Mordor (the Black Land) - no record of an earlier name for this region exists. After the defeat of Sauron in the War of the Last Alliance, Mordor was taken under the control of Gondor, and the Gondorians built fortifications around it to prevent the return of evil things. As Gondor's power faded, however, Mordor once again fell into the hands of the Enemy, and after two thousand years of relative peace, the Nazgûl returned and claimed the land once again in the name of Sauron. Sauron himself, however, dwelt at Dol Guldur in Mirkwood, and did not return openly to Barad-dûr until some seventy years before the War of the Ring. 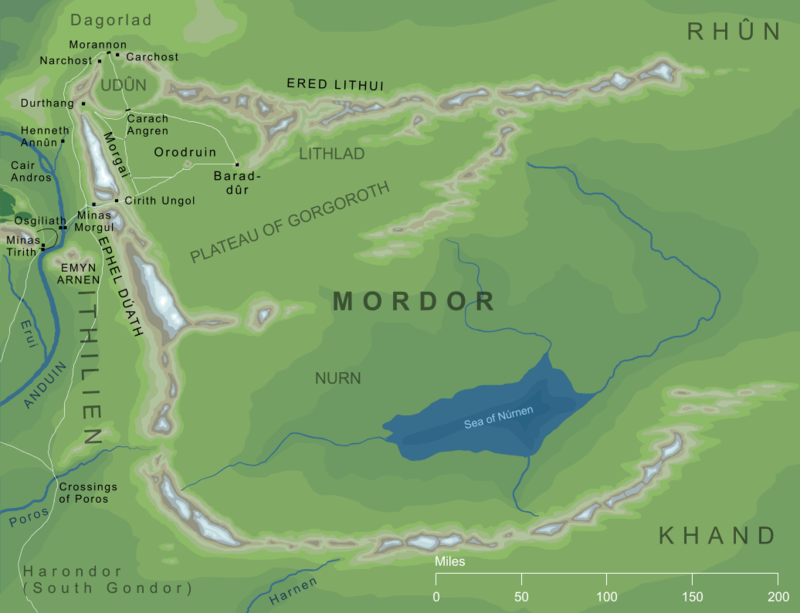 Mordor was a land of approximately rectangular shape, measuring some 600 miles east to west and 400 north to south. On all but its eastern borders, where it marched with Rhûn and Khand, it was surrounded by the mountains of the Ered Lithui and the Ephel Dúath. Offshoots of its mountain fences divided the land into two distinct regions, the barren uplands of Gorgoroth in the northwest, and the more fertile southern plain of Nurn, where the inland sea of Núrnen lay. In the far northwest of Mordor, where the mountains of the Ered Lithui and Ephel Dúath came together, lay a valley named Udûn (after the ancient fortress of Melkor in the north of the World). This was the only break in Mordor's western mountain-defences, and Sauron built a great gate, the Morannon, at its mouth to protect his realm. Mordor is not mentioned in the histories of Middle-earth before the end of the first millennium of the Second Age1, when Sauron chose it as his dwelling place. While its natural defences must have influenced his decision, we are told that the main reason for his choice was Orodruin, the great volcano that lay in the central regions of the Plateau of Gorgoroth, and which Sauron used in his sorcery, including the forging of the One Ring. Through the rest of the Second Age, Mordor became a base for Sauron's struggle for power in Middle-earth. Though he had many successes in this struggle, at one time controlling all of Eriador, he also suffered many setbacks at the hands of the Elves and, especially, the Númenóreans. The worst of these reverses came in 3262 (Second Age) when Ar-Pharazôn, the last King of Númenor, landed in Middle-earth with an unstoppable army. Sauron's forces fled, and he offered himself as hostage to Ar-Pharazôn, leaving Mordor and travelling with the victorious Númenóreans back to their island home. We are told little of Mordor after Sauron left it - his armies having fled, it must have been an empty, barren place for a time. Eventually, though, some part of his followers seem to have returned. After the destruction of Númenor and the founding of Gondor by Elendil and his sons, one of their first works was the building of Minas Ithil at the feet of the Ephel Dúath 'as a threat to Mordor'2, which suggests that even with Sauron absent, the remaining inhabitants of the Black Land posed a threat of their own. Sauron himself secretly returned to the Black Land after the Downfall of Númenor, and the Gondorians were apparently unaware of this for a time. Soon, though, Orodruin burst into life once more, and the Men of Gondor understood that the Dark Lord had returned to Barad-dûr. After more than a century, in 3429, Sauron had rebuilt his armies sufficiently to contemplate an assault on the newly founded kingdom of Gondor on his western borders. He attacked and took Minas Ithil, but Isildur (who dwelt there at that time), escaped and fled north to his father in Arnor. Sauron's stroke was mistimed, for he was not yet strong enough to capture Osgiliath, Gondor's capital, and this gave Elendil the time to forge a military alliance with his friend Gil-galad, the last High King of the Noldor. Elendil and Gil-galad marched with the host of this Last Alliance to the gates of Mordor, where they worsted Sauron in a mighty battle on the plain afterwards called the Dagorlad. There followed the seven-year Siege of Barad-dûr, but the forces of the Last Alliance eventually captured the Dark Tower, razed it to its foundations, and consigned Sauron to the shadows. Through some two thousand years of the Third Age, Mordor was a deserted and empty land, under the control of the Gondorians (although none of that people dwelt there). As time passed, though, and the power and might of Gondor dwindled, the watch on the borders of Mordor was relaxed. In 1975 (Third Age), the Battle of Fornost was fought in the north, and the forces of Angmar were defeated. The Witch-king of Angmar (the Lord of the Nazgûl) fled into the south and entered Mordor, taking it again in the name of Sauron and gathering the others of his order there. The Gondorian watch on Mordor had not been maintained, and after the Dark Plague some three hundred years earlier, Minas Ithil and the other forts and castles on Mordor's borders stood empty. This made the Nazgûl's return all the easier. Soon after their return, the Nazgûl attacked Minas Ithil, and took it once again. This was in the year 2000, twenty years after their return, and Minas Ithil withstood a two-year siege before it fell. We know the Tower was unmanned in 1980, so we must assume that the Gondorians had quickly garrisoned the city once they learned of the Nazgûl's return - this makes sense when we consider that the King of Gondor at that time was Eärnil II, who was a great general before he became King. After its capture, Minas Ithil was renamed Minas Morgul, the Tower of Sorcery, and so the ancient dwelling of Isildur became a dark place and a threat to the Gondorians who had built it two thousand years before. For a thousand years, Mordor was to be ruled in Sauron's stead by the Lord of the Nazgûl. Sauron himself was slowly and secretly growing in power at Dol Guldur to the north, and did not wish to reveal himself until he had sufficient strength to face his enemies. By 2941 (Third Age), Sauron had grown sufficiently to face his foes. The White Council attacked Dol Guldur, but he had prepared for this and abandoned that stronghold, returning to his ancient kingdom of Mordor in the following year. He rebuilt his capital of Barad-dûr (whose foundations, made with the power of the Ring, had remained intact) and began the ordering of Mordor for war. That war, the War of the Ring, was to see his final downfall. In its closing days, an army of Gondor stood before the Morannon and challenged him, and he sent overwhelming forces to answer their challenge. Secure in the certainty of his victory, he was unaware that two Hobbits, Frodo Baggins and Samwise Gamgee, had secretly entered Mordor over the Ephel Dúath with the One Ring. Travelling across Gorgoroth, they reached Orodruin where the Ring was destroyed, bringing Sauron's rule to an end. We take this dating from the Tale of Years. In the Akallabêth, though, Tolkien writes 'Already in the days of Tar-Minastir, the eleventh King of Numenor, [Sauron] had fortified the land of Mordor...'. Tar-Minastir ruled Númenor between II 1731 and II 1869, some eight centuries after the Tale of Years says Sauron installed himself in Mordor, so we take this reference to mean simply 'Mordor was already fortified in the time of Tar-Minastir' rather than 'Mordor was fortified during the time of Tar-Minastir'. From Of the Rings of Power and the Third Age.